Learn to skydive: What is the AFF course? If you are a thrill seeker, adrenaline junky or extreme sports addict then at some point you will probably want to learn to skydive. A little research and you’ll discover the AFF (accelerated freefall) course, and want to know more. So in this article we answer the common question what is the AFF course? There are few extreme sports as addictive as skydiving. You’re very unlikely to meet anyone who’s jumped who doesn’t have a strong opinion about it, either positive or (very rarely) negative. Ask someone how their skydive went, and they’re unlikely to be non-committal. 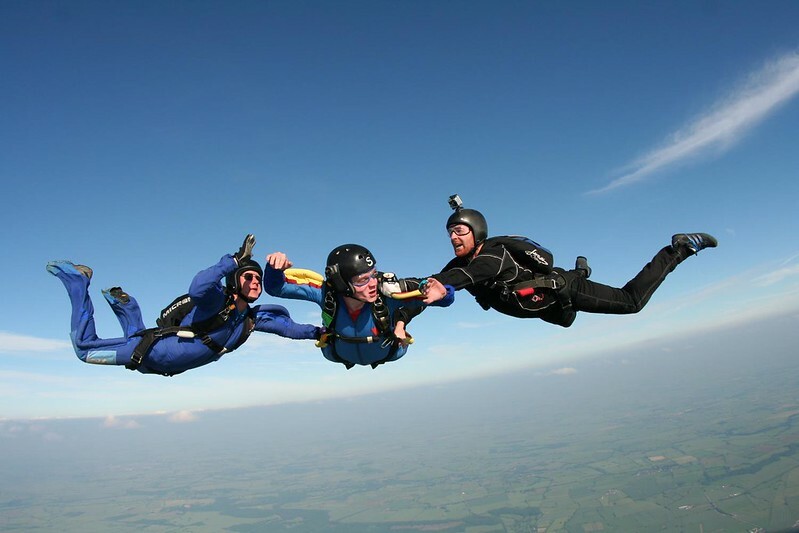 Once you’ve completed your first accompanied or tandem jump and decided that you can’t live your life without this thrill, you need to think about learning the skills to do it solo. Tandem jumps are great for beginners but nothing compares to the sheer thrill of your first solo jump. What is the AFF course? 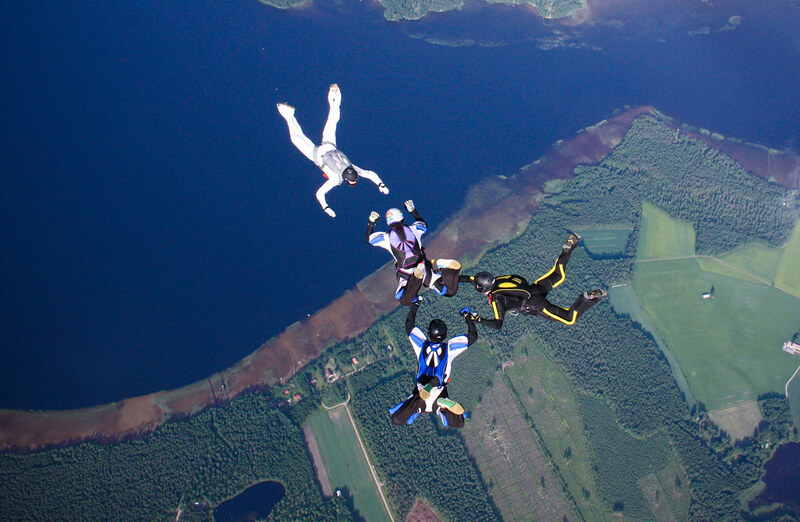 When you learn to skydive, you have to complete a full accelerated freefall (AFF) course. This is a fast-paced and intensive course where you get to experience freefall on your first jump, with instructor supervision. It is available all over the world and once you have passed you can skydive in any dropzone. The AFF course consists of eight levels, as well as a further ten ‘consolidation jumps’ without an instructor before you can become a licensed skydiver. The levels may vary slightly depending on the school but the basic skill set is always the same. Level 1 of AFF is a two-day course designed to teach you all the basics and safety instructions. You’ll learn how to check your chute and equipment, how to board the plane, correct body and exit positions, before finally getting to experience freefall under supervision. It’s recommended you complete this on two consecutive days and are required to do the second day within one month of the first. You get to skydive again with two instructors but this time with more freedom. On level 3, they will completely release you but you need to demonstrate you have mastered the necessary skills, including monitoring altitude and body position. Having demonstrated your basic skills, you now need to start mastering more complicated ones, such as control of direction and basic turns, progressing onto more complex turns in level 5. This is a big one. It will be the first time you jump without an instructor holding on to you. You will show you can regain control and stability and work on your tracking, which is an essential skill for when you jump with others. The whole jump will be solo if all goes well but your instructor will be right on hand. You’ll now have to put all these skills into a sequence. Once your instructors are happy that you have satisfactorily done so, they will clear you to make your first freefall jump without an instructor. The hop’n’pop – your very first unaccompanied solo jump from 5,000 feet. This is the really big one and potentially the start of a lifetime of solo jumping if all goes well. Your instructors will examine your jump and go over a video offering feedback. After this comes your ‘consolidation period’ and then you are a fully certified skydiver. We hope that answers the question ‘Wht is the AFF course?’, typically courses can be completed in one seven day period or can be spread out over a longer timescale, with jumps on days when the weather is good. If you want to learn to skydive, the AFF course is for you. ‘Need for speed’ Swiss adrenaline break: Best extreme weekend? Borealis Shaman snowboard review: Best all mountain do it all snowboard? Heli biking in New Zealand: The best MTB adventure ever? Best scuba diving in Texas: Dive the Gulf of Mexico – Yee Haw!